Our department is included in the School of Human Services and Social Sciences. 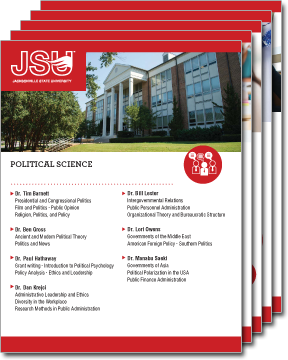 We have seven full-time professors and four adjunct faculty that teach a variety of political science and public administration courses. At this time, we have 111 undergraduate majors and 81 graduate students. We offer a Bachelor of Arts (BA) degree in Political Science and a Master of Public Administration (MPA) degree. The BA has several focus areas: Pre-Law, Theory and Methodology, American Government, and Global Studies. A Minor in International Studies is also offered from our department. The MPA currently has five concentrations: Business, Criminal Justice, Education, Emergency Management, and Political Science. We have attained national accreditation from NASPAA for our MPA program. For more information on a career with a Political Science degree, please visit the American Political Science Association.